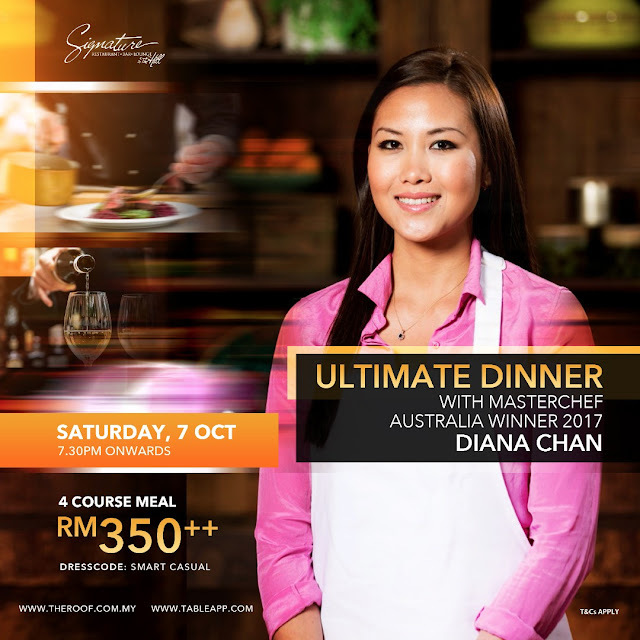 I'm going to dine with Diana Chan, MasterChef Australia 2017 Winner! Another Malaysian has made us proud! Meet Diana Chan, the MasterChef Australia 2017 winner! She's not only attractive, she's passionate, and talented! Hey I thought God is fair? Diana is born and bred in Setiawan Perak before moving at the agree of three to Johor Baru, her main inspiration when it comes to cooking is from her parents. Diana would like to support home grown brands (Malaysian) as her Malaysian heritage is something she feels very connected to. Her cooking inspiration is deeply rooted in Malaysia. What she would like to do is to bring that Malaysian heritage over to an Australian (which she did!) or a global audience through good exposure through events and social media exposure. Having an immense passion for Asian flavours thanks of her Peranakan background, Diana is able to bring together an amazing blend infused cuisine which would appeal to both local and international audiences. Apart from her cooking, Diana is also a strong believer in having a balance lifestyle herself, she is very much into fitness and balances it out with her fun and adventurous side by indulging in good food, drinks and absorbing cultures wherever she travels. Want to get a taste of Diana's cooking? Come join me and others this Saturday (7th October 2017) 7.30pm at Signature, The Roof to experience the Ultimate Dinner where she will serve her signature dishes while she explains each and every dish inspiration and the meaning behind the creation. Here's a sneak peek of the Ultimate Menu that will be served this Saturday, and I'm really excited to try them! If you are a food lover, this is an experience you don't want to miss. Plus it's Diana cooking FOR YOU. Have the experience unlike any other with this Ultimate Dinner 4 course meal at only RM350++. Make your reservation now at http://bit.ly/2xaEtuO or call 0386053388 for more info.